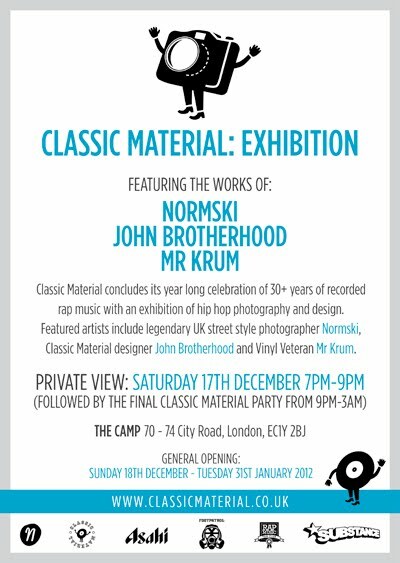 CLASSIC MATERIAL concludes its year long series of events celebrating 30+ years of recorded rap music with an exhibition of hip hop photography and design. 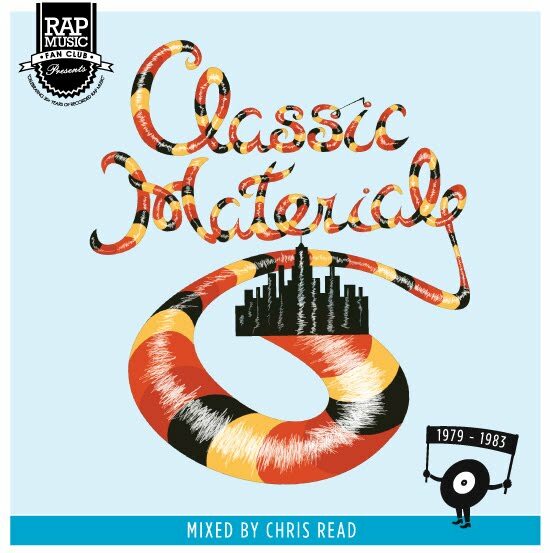 Featured artists include legendary UK street style photographer NORMSKI, Classic Material designer JOHN BROTHERHOOD and my fellow Vinyl Veteran MR KRUM. This exhibition is an opportunity to look back on the last year of events and to thank the contributors as well as showing some fantastic work and introducing some of the new CLASSIC MATERIAL projects for 2012. The private view, sponsored by Asahi beer, in association with Foot Patrol takes place from 7pm until 9pm at City Arts and Music Project this Saturday (17th December). Entry is FREE and open to all. For many years prior Normski had been documenting the rise of hip hop culture in the UK and UK club culture through photography. As a key figure on the UK’s early hip hop scene, Normski enjoyed unparallelled access to rising stars of the home grown scene and touring acts from the US who appear in his own particular brand of portrait photography. 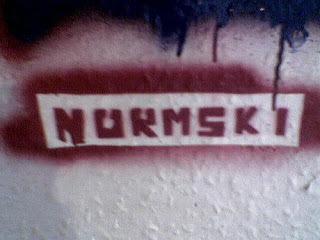 Well known subjects appearing in Normski’s work include the likes of Big Daddy Kane, Biz Markie and Public Enemy. In recent years, Normski’s photographic works have experienced a renaissance with high profile exhibitions at venues across the UK. As a member of the WeLikeOurJob team, John Brotherhood is the man behind the majority of design work for Chris Read’s Music of Substance club night, website and mixtapes. 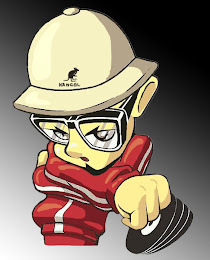 With a shared passion for the design elements of hip hop’s history, John was a natural choice as Classic Material’s in house designer. Currently responsible for the runnings of London’s Foot Patrol sneaker emporium, John continues to be active as a designer. 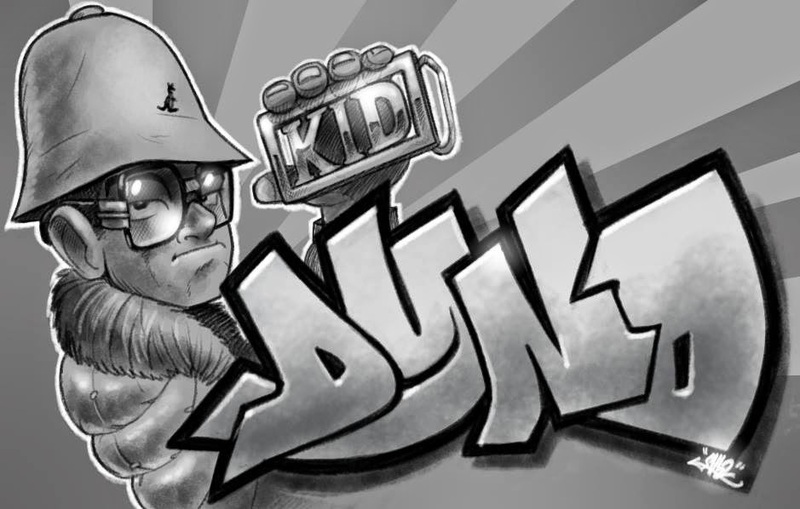 Vinyl Veteran Mr Krum combines an in depth knowledge of music history with a passion for vinyl and the skills of seasoned designer to produce original works which draw influence from a variety of sources. Having recently applied his skills to record sleeve cover art for artists including DJ Format, The Simonsound and Soundsci, his work is currently in demand: Forthcoming releases for which Mr Krum has been enlisted to provide artwork include numerous members of New York’s hip hop underground royalty, amongst them the likes of Grap Luva, DJ Spinna feat Oxygen and Lord Finesse.